The Water Reservoir. One of the most critical differences between Keurig K475 and K575 is a water reservoir. The K475 version has a capacity of a large 70 oz, but K575 packs a larger 80 oz. An extra cup of coffee at your disposal. Hot Water on Demand. This is a feature that gives it the versatility to provide coffee and non-coffee lovers the beverage they desire. Unfortunately for K475, it is incapable of providing hot water on-demand. The K575 model however does, thanks to its extra 10 oz of the water reservoir. Touch Screen Display. While they do both have touchscreen displays, the newer model K575 has a wider and more enhanced configuration. It has a 2.8-inch colored display while the earlier model K475 only has 2.4-inch colored display. You can even change your background wallpaper on the K575. Nightlight. Yet another feature of K575 that you can’t see in the K475 model. Quite an important feature for the night owls who tends to stay up late at night. The features are where you can really differentiate Keurig K475 vs K575. Similar to K575, the K475 is also a programmable coffee brewer. It integrates an automatic on and off system that users can choose the specific time it shuts off or powers on. A very convenient feature considering that most people want their coffee on the go without concerning themselves of heating the coffee maker up or shutting it down. Another feature worth mentioning is the “Hot Water on Demand”. Not all coffee makers have this feature and fortunately for the K575 version, it is available. Not so fortunate for the K475 however with its lower water reservoir. It doesn’t have enough to provide users with a hot water on the go. Now talking about brew sizes, the K575 offers 10 different sizes while the K475 only has 9. They both are able to provide sizes between 4 oz up to 30 oz, but the K575 is able to provide you with an 18 oz Vue pod and K-Mug brew size. Not much of a difference, but a difference nonetheless. It is something for those looking for the exact amount of coffee in their everyday lives. From this point on, you might be thinking, “There are hardly any differences between the two coffee makers”. Well, you are not wrong. That is because the K575 is somewhat an upgraded version of K475. And seeing that K475 has received phenomenal reviews, you can only do so much to improve a coffee maker that is already a good one. The sole reason why there isn’t much difference between the two. Here are some features that both coffee makers have in common. Temperature control. Most people don’t know this but it is one of the key factors that lead to a specific taste when brewing coffee. Some might assume it is just numbers, but those numbers add up to how your coffee would taste in the end. Too low of a temperature can lead to a sour taste, while too much temperature can lead to bitterness. Strength Control. Users are given the option to control how strong their coffee would taste like. Some prefer regular while some prefer a bolder taste. That is why this feature is one thing you should look out for in coffee makers. High Altitude Setting. This is helpful to those who are in a higher altitude environment. It is available in all Keurig 2.0 models and is a good addition that adjusts the overall temperature, resulting to a good 192 degrees (Fahrenheit) or 89 degrees (Celsius). Touchscreen Controls. This adds convenience to your coffee maker usage. This is where you can easily modify the configurations and/or settings of the product. Brew Time. This is essential to those in a hurry and can’t afford to waste precious minutes by waiting for their coffee to brew. For Carafe brewing, both give you a 3-minute waiting time. For the cup brewing, it only takes under a minute. So how capable are these coffee makers? Are they really that good as advertised? To answer these questions, we had to first read through and analyze a lot of comparison reviews of K575 and K475. We didn’t just stay on written reviews, but ventured out to check video reviews. Not surprisingly, we found out that they are in fact capable and performs well for a coffee maker with their price. In fact, some prefer these two rather than the most expensive ones that are too complicated to set up or use. Second, we had to factor in the features that really makes a good coffee maker involving consumers’ preferences. And seeing that the two have in fact most of the features listed, the answer would be a conclusive “Yes”. As in they are a good pair of coffee makers that can brew your coffee just the way you like it. The temperature control is accurate and the strength control is on point. The design of these coffee makers is almost identical. The only difference between the two are the color options and the sizes of its display screen. The K475 comes in different colors namely black, white or red. The K575 on the other hand unfortunately comes in a single color, platinum. Speaking of display screens, K475 features a 2.4-inch color touch display while the K575 features a 2.8-inch color touch display. They both have a boxy shape with circular edges with an attractive design that blends well with most rooms. Both are fairly portable and easily placed in counters that are at least 11 inches wide. As seen from the comparison chart listed above, they carry the same weight and are with the same dimensions. Coffee taste mainly relies on how well you handle the temperature and how long or how short was the brewing time. A coffee machine can only do so much as to heat up your water and mix in your K-Cup pod. Of course, there is still that reliability on how well it is able to mix them both and the accuracy of the temperature. But surely enough it will still rely on your configuration and brewing time. As mentioned earlier, brewing a coffee at a low temperature will give it a sour taste. Brewing it on a higher temperature than the average would give it a bitter taste. The recommended average brewing temperature goes between 195 F and 205 F. That is 91 and 96 in Celsius. Going over the 212 F mark can burn the coffee and go under 190 may not bring out the best in your pods. Now talking about strength, there is a setting that you can select from. It’s as simple as punching in your preferred taste on the LCD touch screen display. You can go weak or you can go bold. Of course, there is also the consideration of each one’s own taste. Some may like their coffee with a little bitterness or sourness in them. Regardless of how you prefer your coffee will be, you can surely rely on these two coffee makers to brew them. They have their own temperature and strength control. Not to mention, they are extremely accurate and reliable. 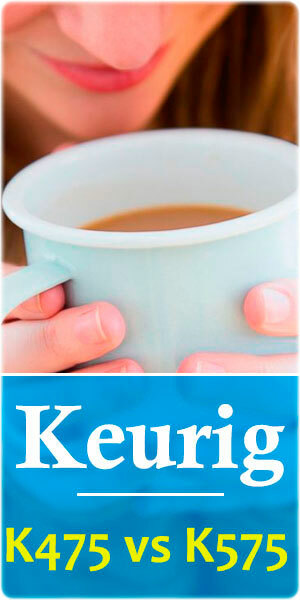 Interesting Read: What’s the Difference between Keurig K200 and K250? 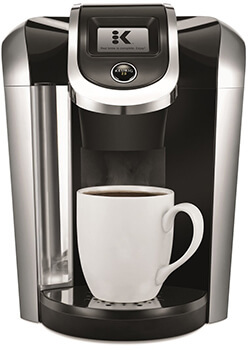 The K475 model, or also known as Keurig 70oz is one of the most top-rated coffee makers out there. It has a 70 oz water reservoir capacity that is able to fill up 8 cups or more before having to refill. It offers a strength control feature that you can adjust to your taste. You can also choose from 5 temperature settings for that perfect brew. What people often forget about the K475 is it still is a high-performing coffee maker despite of its differences from the K575. It may only have a couple of advantages and more disadvantages but that is when you compare it to a high-end coffee maker that is the K575. In fact, it is much better than most of your traditional coffee makers that are out there. The product includes 6 K-Cup pods, 2 filters, and a water handle. It is conveniently portable with a lightweight and fairly compact design. As you may have seen from different reviews, this is a more enhanced model of the K475. 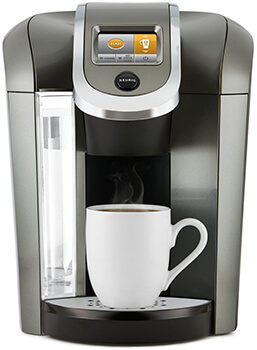 It has more features and the flexibility that is highly convenient for non-coffee drinkers. If you look closely, there isn’t really much difference other than a few doodads and a few characteristics. What really makes this more superior than the 475 model is the hot water on demand and the larger water reservoir. Other than that, they are somewhat similar in other aspects. Similar to K475, it has a removable drip tray, strength and temperature controls, automated on and off, and they even have the same brewing time of under a minute. It does have a larger touchscreen display with the nightlight which is not available to the 475 model. The product also comes with 6 K-cup pods, 2 filters and a filter handle. It has the same weight and dimensions, making it conveniently portable. You can have your coffee in under a minute. Has an attractive modern design. It has a removable drip tray. This product is fairly cheaper than K575 with a $30 difference. It is capable and reliable. Offers temperature and strength control. Has an automated on and off feature. Does not have the “Hot Water On-Demand” feature. Has lesser water reservoir at 70 oz. Does not come with carafe. The product has a large screen touch display at 2.8 inches. This product has a Larger water reservoir at 80 oz capacity. Features a nightlight that can be helpful during coffee runs during nighttime or early in the morning. It has a hot water on-demand feature that is quite handy for tea or Hot Choco lovers. Has 10 different options for brew sizes. A little more expensive vs K475’s price tag. As we pitted these two side by side and evaluated their pros and cons, the Keurig K575 Plus Series is no doubt the better coffee maker. But keep this in mind. It is not necessarily the best option for you, since you do have to consider your budget. A $30 difference is not something you can just ignore. You can even look for much better deals that can go as much as $50 difference. That being said, we highly recommend the more upgraded and advanced coffee maker which is the K575. That is if you can spare the extra $30. It is worth the extra cash and the thousands of customer reviews seem to agree with us. If you are looking to buy the best price for the value, the K475 is the better option. It is a reliable, capable, and affordable coffee maker. It has all the necessary features that make a good coffee maker.